This species is called the Elongate Tusk, scientific name Antalis Longitarsus; family Dentaliida. 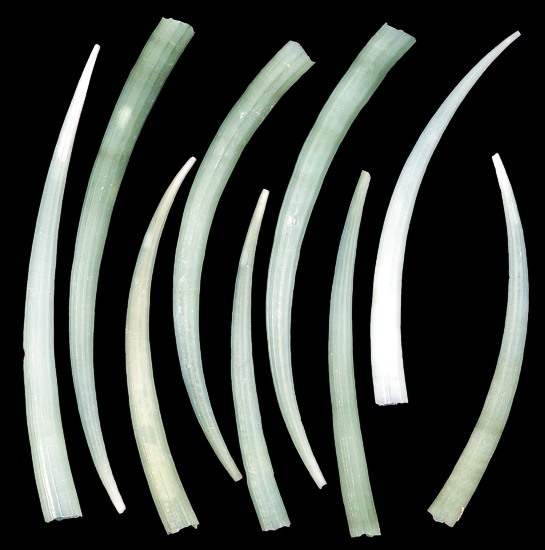 Like other Tusks it is elongated and tapered. It is a thin, shiny shell that is slightly curved with a rough edged aperture. The narrower end has a small notch. Other than a few growth rings, the shell is almost smooth. In older species, the shell has fine longitudinal lines. Depending on their environment, most will show some calcium on their outer shell and often will have a small predator bore hole. The shell's color is white with a mix of yellowish or greenish tinge. On rare occasions specimens have been found with a pinkish or apricot color. The Elongate Tusk is found in the Indo-Pacific region, ranging from eastern Africa to the northern shores of Australia/New Zealand Then North to just south of the Sea of Japan. 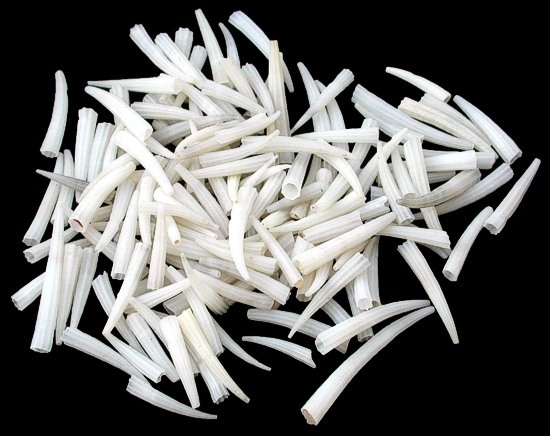 This species is called the White Tusk, a gastropod; family Dentaliida; class Scaphopoda. Like other Tusks it is elongated and tapered. It is a thin,and sometimes shiny shell that is slightly curved . Other than a few growth rings, the shell is almost smooth. In older species, the shell has fine longitudinal lines. Its color is white to a grayish tinge. The White Tusk is found in the Indo-Pacific region, ranging from eastern Africa to the northern shores of Australia/New Zealand Then North to just south of the Sea of Japan. These are strictly a salt water species. Their shell has an opening at each end. Tusks prefer sandy or muddy ocean floors, where they burrow into the sand with their small end up. The tusks have been found in tidal zones and water several hundred feet deep. These are not commonly found.